Writer Meghan O’Gieblyn is quick to be labeled a skeptic by anyone who has read her latest collection of essays, Interior States — and with good reason. 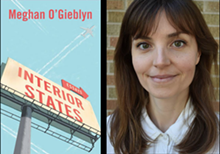 O’Gieblyn intricately applies her experiences of having been raised in Midwestern evangelical family to the “existential dizziness” she sought out as an adult to better understand herself and her world. O’Gieblyn will appear at Pages Bookshop to discuss her religon-centric adventures and many internal findings from Interior States including creationist museums, religious theme parks, Christian rock, the problem with Henry Ford’s Greenfield Village, as well as her thoughts on Emma Donogue’s The Wonder.